Enough already! I get it.. you are lazy like me! There’s nothing wrong with that really… Some of the greatest things in the world were invented by lazy people… naps… cold pizza… foot rests…. wine (think about it.. “oh crap.. I forgot I left my grape juice out.. oh well.. I’m sure it’s still good”). It’s actually a lot more work to be lazy than you think. Us lazy people spend a lot of brain power to try and figure out how to do things faster and with less effort. If you are following along and want this to work for you, stop right now and go back to my post on creating a parent/child relationship and follow that post up until the section labeled “CREATE A PAGE FOR CREATING A NEW TIME LOG ENTRY AND STORE PARENT’S ID”. You with me? You know where we are at? At this point you have a Issue display page that also shows the corresponding time entries in a list. You also have a link to “Create a new Time Log Entry…” in that list. Clicking that link should take you to the New Item entry page for a time entry with a Query String variable of “IssueID” and a value. 2. Give your document library a name (I generally use “Pages” because that’s how I roll). 4. When list is created click on “New” and create your new page. As far as template layout is concerned, choose whatever floats your boat. Also, name your page “NewTimeEntry” for the purposes of this blog, anything else is fine too if you just want to be a rebel. Okay! Your new page is now created… now comes the fun parts. Yes.. it IS kinda sad that I consider this fun… you should see me on the weekends. 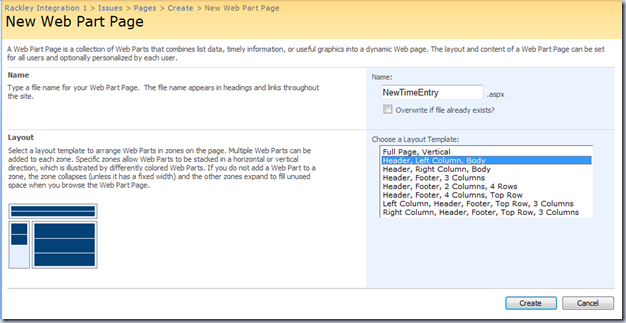 Now that we have our new page let’s open it up in SharePoint Designer. Fire up SPD and open the site (File->Open Site) containing your issues list, time entry list, and the page we just created. 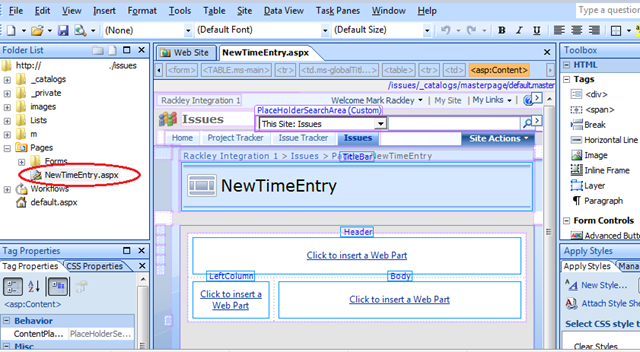 Open up the page we just created (expand Pages and double click on “NewTimeEntry.aspx”). 1. Click in the “Header” area of the design view to get the proper focus on the page. 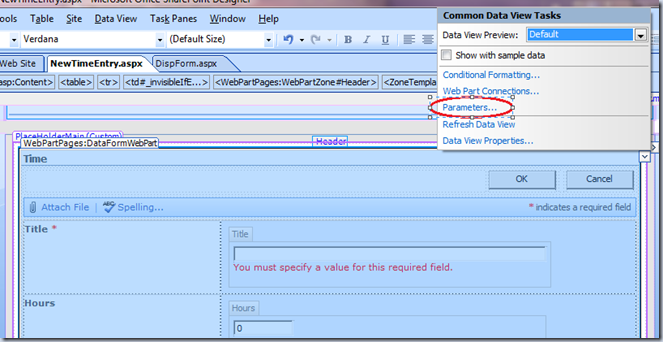 Go ahead and save your page… #1 rule of SharePoint Designer… “Save Often”. Before we go any further, let’s go back to the DispForm.aspx for our Issue Page and make our “Create a new Time entry” link point to the page we just created. Save your page. Okay, so now… if you go to the “Issue” display page and click on the link to “Create a new time log entry” it should take you to our newly created page. Pretty easy? Still with me? Another important note.. ALWAYS use RELATIVE URLS! Never use FQDN (Fully Qualified Domain Names) for your links. You will thank me later. 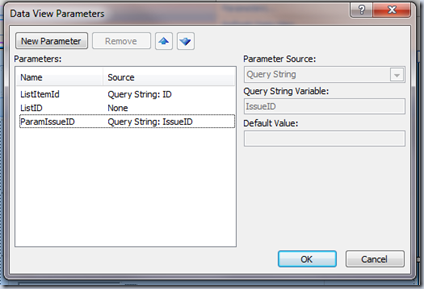 Now we need to store the IssueID passed in the Query String and store it in a Parameter our DataFormWebPart can use. We now need to get that Parameter Value stored in the IssueID field. The only problem is, we can’t do it with the field in the current state. Go ahead and try, if you try to set the IssueID’s value to the parameter value you get an error.. SPD won’t let you do it. Right click on the “IssueID” field and select “Format Item as->Text Box”. Why? How hard did you think it was going to be? Okay.. we are just about done. We now need to set the value of this IssueID Text Field to the value of the Parameter we previously created. And there you have it. Save your page. Go to you Issue Display Page and click on the “Create new Time Log Entry” link. It will open up the NewTimeEntry.aspx page we created and the “IssueID” field will contain the same value as the Query String variable “IssueID”. Go ahead, save your entry… it works fine. Trust me. well.. don’t trust me… try it first. Okay.. thanks.. welcome back… If you were go forward with this into production you do NOT want the “IssueID” field to be visible on the page for a user to start calling you and say “Hey, what’s that there for” or worse yet, they get clever and change the value which screws everything up. So, lets hide the field from view but make sure the value still gets stored. Makes sense? Go back and test it again… the Issue ID field is gone from the NewTimeEntry.aspx page, but everything still works. And there you have it! Happy? Solve your issues? Open up new issues? Keep the questions coming and I’ll do what I can to help! Thanks again for stopping by. Great post, Mark. There is a team member who was trying to do something like this. I'll send it over to him. Post very complete with a lot of tips&tricks very useful! Thanks. I had a question on form field display: i didn't found how to remove label Filed and keep only Field Value? For example in Title form field, Title Label is displayed, then title value and title description. Do you know how hide Title Label? but there is one aspect in which i woudl like to get your help, that is.. hwo to set Picture/Hyperlink fields of the form with QueryString parameters. if i convert the Hyperlink/Picture field to textbox field, it does show the parameter value in the text box btu then it doesnt save it when i click OK (for example on NewForm.aspx) for some list. the Picture / Hyperlink just remains empty fields where as all the other text (TextBox-able fields) gets saved. Hello! Your post was very useful to me, but I have some troubles with my issues: I try to automatically fill that asp textbox with the parameter that I get from dataview web-part, formatted as a selectbox. I use web-part connection between the selectbox and listform web-part and get the chosen record ID to the parameter in listform. 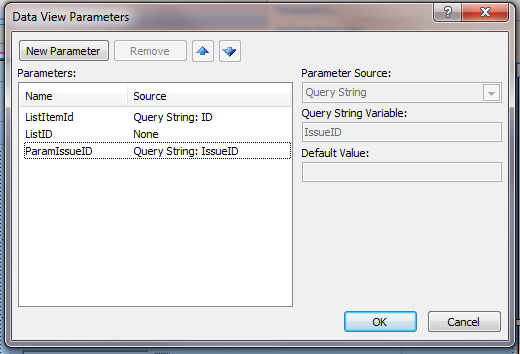 But how to dynamically send that parameter to asptextbox? Thank you! We are having an issue getting the custom list form to render. Each field displays an error: "Object reference not set to an instance of an object". this happens with the single and multiple use forms (not for viewing the items though). it's an error we get on production and dev environments. 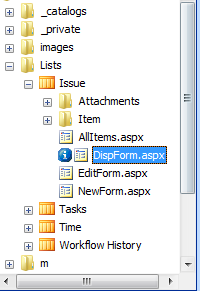 any ideas on why the form controls do not render in spd??? Great post Mark. Made our life easier. The only problem i am facing here is that when i try to save the form its not getting saved. And more over it throws error saying " Invalid data has been used to update the list item. The field you are trying to update may be read only." I exactly followed what u said. So i dint make any field non editable then y is it giving error. How should i solve it please help. I have a query. I have three pages. p1,p2 &p3. User will be redirected from p1 to p2. On p2 I have a Form Web Part. I want to fill up a text box of this web part with the value in querystring(from p1). After that, when user submits p2, he will be redirected to p3. On p3 I have DataFormWebPart that shows the status message according to what is submitted from p2. So, my question is, Is it possible to fill up textbox of Form Web Part with querystring value? 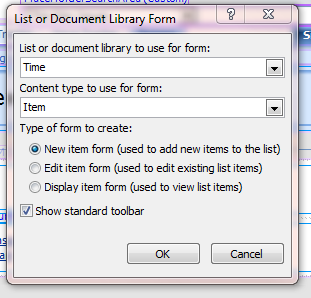 I got this to work just fine for a custom list... now... How do I make it work for a document library? I have the same requirement in sharepoint 2010. 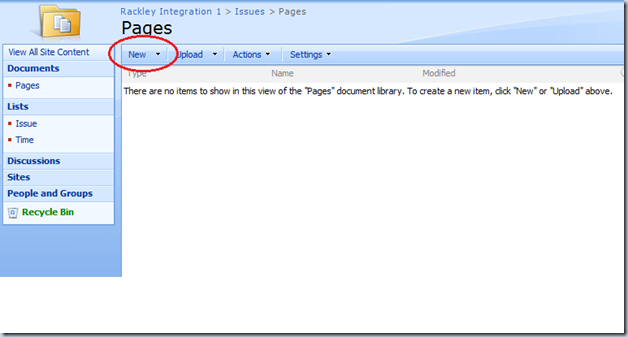 Could you please give me the steps for sharepoint 2010? I have followed the same in sharepoint 2010, but no luck. The steps you mentioned is looking very simple. It would be great if I get the steps in Sharepoint 2010. 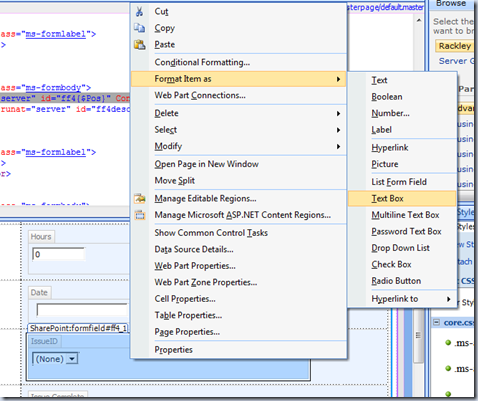 Nice article for SharePoint 2007 developers. 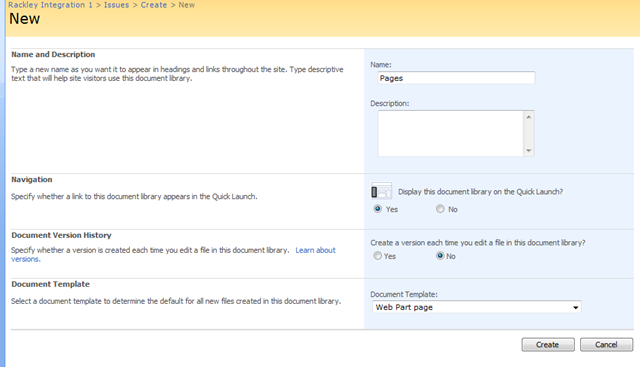 Would be great if I get same steps in SharePoint 2011. I have managed to make it work in SharePoint 2010... 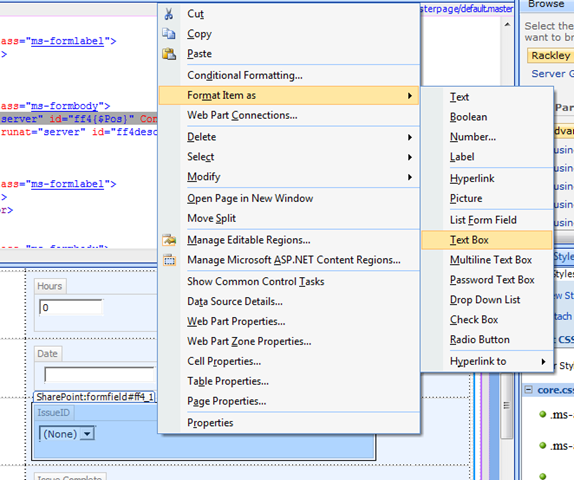 In SPD 2010 you cannot convert a field to a textbox, so you have to make this conversion manually in the code by replacing the <SharePoint:FormField ...> by a <asp:TextBox ...> and by renaming the 'Value' and 'ValueChanged' in the attributes by 'Text' and 'TextChanged'. Also I have removed the attributes ControlMode and FieldName because they don't apply to a Textbox control. Thank you so much for posting this. This is extremely valuable! This works great for a text field, but how would you get it to work on a lookup field. I was so happy when it worked, so I headed back up to the top of the page. It was from you!!! Thanks so much Mark for this example. You made my day. Yay for Yan Locas! I've spent half a day trying to work out how to get that damn field to be a TextBox! Mark - any chance of you re-writing this & your other fab pages to be SP2010 specific? I found a kind of a Sharepoint bug... I have 2 required fields in my form, the first is a Sharepoint:FormField and the other is a asp:textbox which is receiving the querystring parameter. 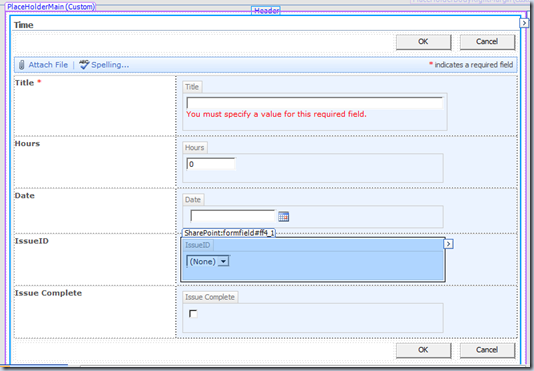 If you submit the form when the asp:textbox field is populated, but leaving the required sharepoint form field blank, the required field red message appears. 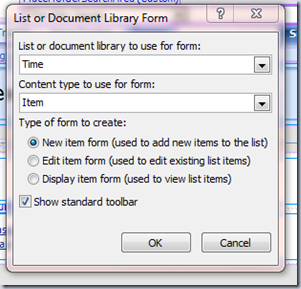 After populating the sharepoint form field and submiting the form again, nothing is recorded in the textbox field. Did you experience this issue? I really need to fix this! I successfully got this working. However, is it possible to set more than one field in the 'Time' list? Ive got an Equipment Management/Maintenance system built in Sharepoint. My 'Issues' list is called "Equipment List" and my 'Time' list is "Equipment Maintenance Log". My Eq List contains all of the equipment (name, mfg, model, serial number, location, etc). 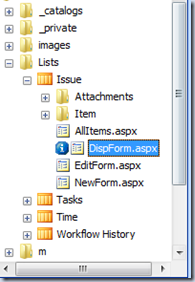 I then have cascading dropdowns on that lists NewForm.aspx so I can quickly pick a piece of equipment based on location. Using your parent/child instructions I am successfully 'linking' maintenance records to particular pieces of equipment. However, when I click on the piece of equipment I dont just want it to pass the ID across to the other form, but also the Device Name and Location. Any way to do this? Good Post...Mark. I have one other question. I have more than 3 web parts are on the page. 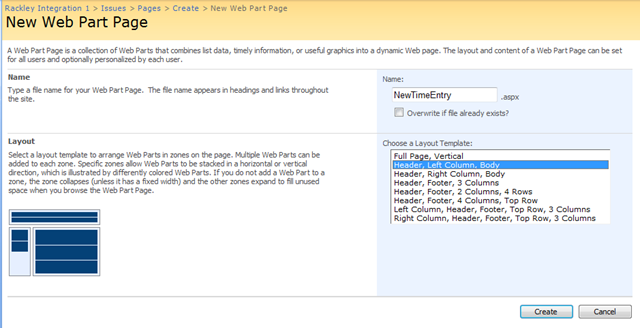 Webparts are New Entry Form,Video in content Editor, List form. 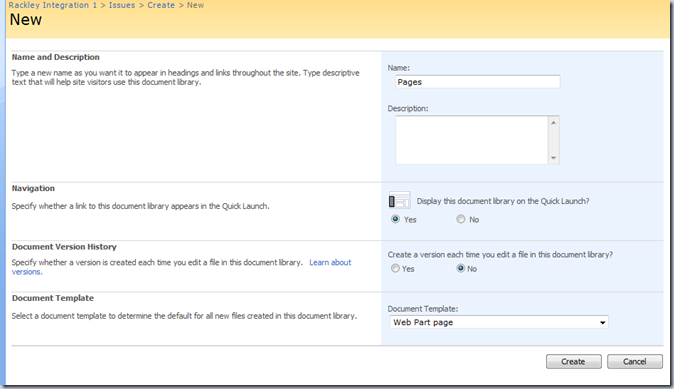 Now problem is that Content editor webpart with video is followed by new entry form. Input fields contains focus. So every time scroll bar comes in middle of the page.It is really annoying. It will be greatful if I can get any solution ASAP. Thanks. This solution unfortunately does not work on the SPS2010 ... is there any other for SPS2010? Work in SP Foundation 2010! You Saved My Life.. Thanks !!!! but the record does not write the value unless I add or delete any character. There may be some way that the TextBox has already recognized the value of QueryString without needing to insert or delete characters to insert the record? This is very cool, and I can make it work, just fine in 2010. Anybody knows how todo the same in editform.aspx? It dosent seem to work at all. Great post -- it was exactly what I needed. It works in 2010 as well, you might want to update your post to reflect that. I know that I skim past posts that aren't tagged with 2010, and this technique still works. Only difference is that you can't seem to get the Format As menu in Code view.